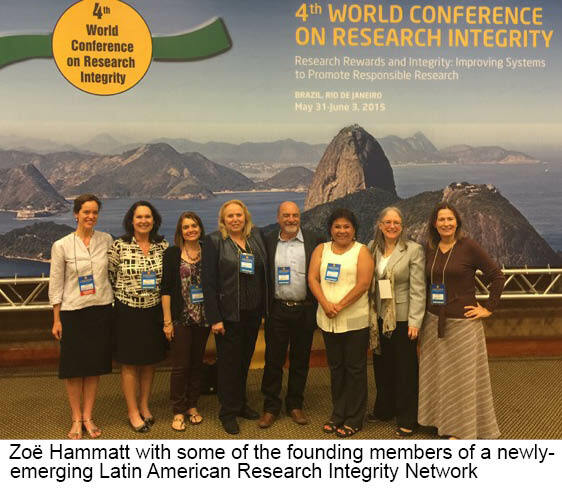 It was a busy trip for Zoë Hammatt (Director, Division of Education and Integrity) and Susan Garfinkel (Director, Division of Investigative Oversight), who represented the U.S. Office of Research Integrity (ORI) at the 4th World Conference on Research Integrity (WCRI), May 31 – June 3, 2015 in Rio de Janeiro. Between them, they hosted a workshop, moderated two discussion sessions, gave a plenary talk, and several presentations. The event, themed “Research Rewards and Integrity: Improving Systems to Promote Responsible Research,” was attended by more than 600 representatives from at least 55 countries, including institutional and government officials, journal editors, publishers, blog site managers, attorneys, and members of the scientific and academic communities. For Zoë and Susan it was a wonderful and exciting opportunity to learn about research integrity efforts and limitations in other countries and to more fully understand how ORI fits into this global context. A significant emphasis of the conference was on the various systems in place for handling research misconduct allegations and promoting integrity through training and education in the responsible conduct of research in different countries. An effort to increase global collaboration is developing, and we are excited about the opportunity to work with various countries to help form networks for the global sharing of resources and policies around research integrity. Of particular interest was the discussion that emerged on how best to handle retractions or corrections of papers when research misconduct findings are made. There was a consensus that a meeting of regulatory institutions, research integrity officers, and editors should be coordinated to define research misconduct vs. falsification, fabrication, and plagiarism, how to handle the timing of retraction or correction notices, and discuss the problems associated with significant media attention when a confidential research misconduct matter is proceeding. ORI hosted a one-day workshop called “Handling Research Misconduct Allegations in a Global Context”. This workshop, attended by over 100 delegates, aimed to familiarize participants with common issues and processes associated with handling allegations of research misconduct. Participants in working groups generated lists of universal “tips” in the following areas: receiving an allegation of research misconduct; receiving an allegation of research misconduct; improving institutional systems for misconduct proceedings; ensuring an adequate and fair hearing process; and ensuring fairness in notifications and reporting. 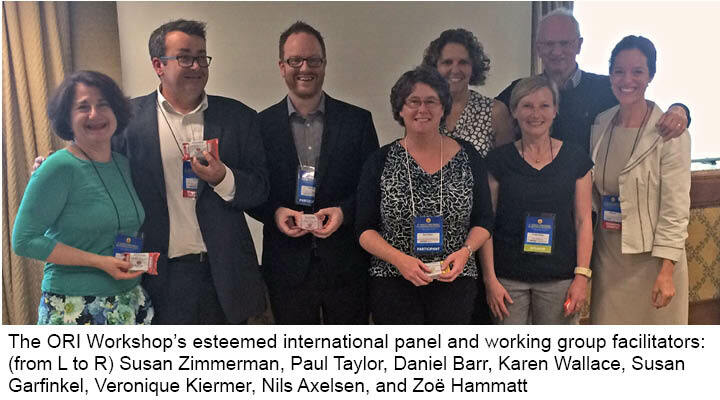 Along with Susan and Zoë, ORI invited an esteemed international panel to run the workshop, including: Nils Axelsen (Staten Serum Institute, Denmark), Paul Taylor, Daniel Barr (both of University of Melbourne, Australia), Susan Zimmerman, and Karen Wallace (both of the Canadian Secretariat on Responsible Conduct of Research, Canada). Unfortunately, Ragnvald Kalleberg (University of Oslo, Norway) and Sun Ping (Ministry of Science and Technology, China) were unable to attend the conference, though they contributed to the creation of the presentations. During the concurrent session “Funders’ role in fostering research integrity” (hosted by Karen Wallace of the Canadian Secretariat on Responsible Conduct of Research), Zoë gave a presentation entitled “U.S. Public Health Service funds in an international setting: Research integrity and compliance”. Her talk shared data on the global distribution of PHS funds and information about ORI’s regulatory requirements, which must be met by U.S. and non-U.S. institutions alike. Participants were intrigued by the prevalence of U.S. PHS funds going to non-U.S. institutions around the world, and expressed commitment to complying with U.S. regulations. Zoë also gave a plenary presentation, entitled “Drivers of research misconduct: Perspectives from the U.S. Office of Research Integrity” (co-authored by Drs. Raju Tamot and John Dahlberg, ORI), during the Drivers of the current research system plenary session hosted by Tony Mayer (Nanyang Technological University, Singapore). Other distinguished panelists included Dr. Otteline Leyser (University of Cambridge & Nuffield Council of Bioethics, UK) and Dr. Phillip Moriarty (University of Nottingham, UK). Zoë received highly positive feedback about the presentation, including gratitude for bringing a human perspective to the ORI case files (expressed by Veronique Kiermer (Executive Editor; Nature). ORI, Universitas 21, and the Asia Pacific Research Integrity Network (APRI) organized a Partner Symposium called “International integrity networks: Working together to ensure research integrity”, which was co-chaired by Paul Taylor (University of Melbourne, Australia; Universitas 21 and APRI) and Zoë Hammat (ORI; APRI). Speakers included Ovid Tzeng (Academia Sinica, Chinese Taipei; APRI), Krista Varantola (Finnish National Board on Research Integrity, Finland; ENRIO. Dr. Varantola also presented on behalf of Nicole Foeger, of the Austrian Agency for Research Integrity & ENRIO), and Susan Zimmerman (Canadian Secretariat on Responsible Conduct of Research, Canada). Although Sun Ping (China) contributed to preparation for this session he was unable to attend the conference. Lessons were also shared from the previous session presented by the Netherlands Research Integrity Network as a model for initiating activity and collaboration across institutional boundaries in a national setting. About 30 attendees joined the symposium, many of whom expressed gratitude for inspiring other networks, including a Latin American Research Integrity Network and an African Research Integrity network. Zoë chaired a concurrent session called “The research environment and its implications for integrity.” Attendees heard engaging presentations from Joeri Tijdink (VU University, Netherlands) on publication pressure, and Ted Rohr (University Of New South Wales, Australia) on cultural influences on research integrity and misconduct. Approximately 40 attendees joined the session and engaged in a vibrant discussion on refining survey tools and exploring preventative measures in the field of research integrity. Thank you to all who helped make the WCRI conference such a success, especially those who helped plan or participated in any of the above-mentioned sessions.